As you can see, it originated from Lanctharus, who is affiliated with the excellent Cap Stable podcast. I don't know if that is his original work, but it definitely made me smile. Brilliant! And surprisingly accurate. He certainly got it right for the Good corp row, which are all new-capsuleer friendly: UNI, Red vs. Blue and Brave Newbies. The rest look about right to me, too. What other corps fall into these categories, I wonder? Post your ideas in the comments. 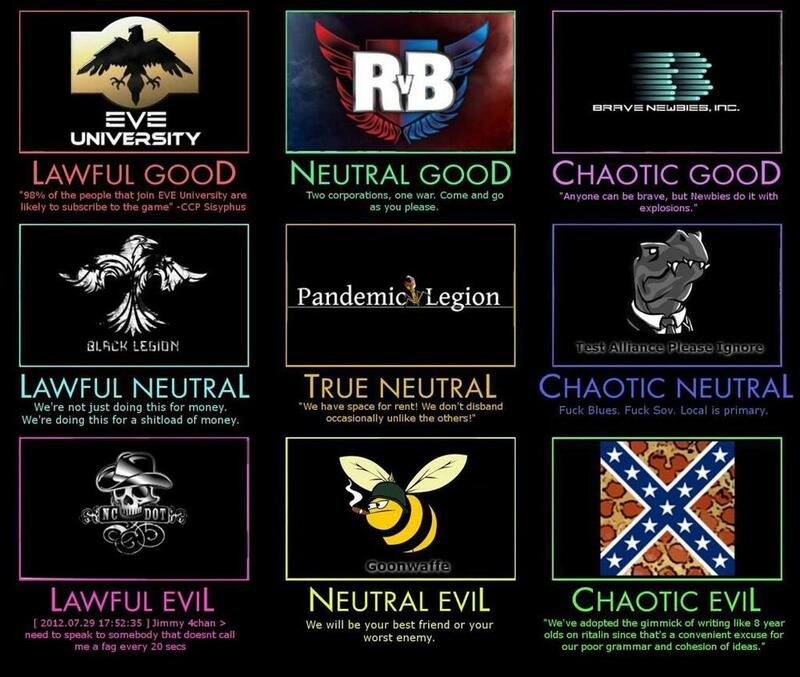 Posted in Fun and tagged with EVE Online, Alignment, Good - Neutral - Evil, Lawful - Neutral - Chaotic. November 4, 2013 by Neville Smit. In Part I of this series, I explained the meaning of the first ten "Dumb Ways to Die" listed in the parody song released by Rixx Javix and Sindel Pellion. If you're not familiar with the song, check it out on Soundcloud here, or on YouTube here. In this post, I will explain the meaning of the remaining ten insta-death inducing goofs mentioned in the lyrics, including why doing these things will kill you, and how dying in these ways can be avoided easily. If you ever do any of these things, you should remember this song and feel bad, because you are dumb. Why you'll die: Wormhole space is dangerous. It is null security space, so anyone can kill anyone with no worries about CONCORD or any implications to their security status. Further, no one is listed in Local chat, so you have no easy way of knowing who is in system with you. As a result, wormhole dwellers quickly learn to use their directional scanner constantly to check for any probes or potentially hostile ships. The best way to remain safe in a wormhole is to be invisible, which means mounting and using a covert operations cloak. With the cloak engaged, no one can see you or track you down. The moment you turn it off, you become scannable, and you can then be found and killed. Why it's dumb: There's no reason to turn off a cloak in wormhole space, unless you need to launch probes or open fire on a target. Becoming visible to ultra-paranoid hostiles in wormholes is akin to advertising a strong desire to die quickly - something the other residents are generally happy to oblige. Why you'll die: Rahadalon is a low-sec system on the edge of the Devoid region. Many pilots, including several large player alliances like TEST, RvB and Brave Newbies, often gather in this system looking for player-vs.-player (PvP) fights. Hunting non-player character (NPC) pirates ("ratting") in the system's four asteroid belts is especially hazardous because of the overabundance of eager pilots looking for kills. Further, because there are so few belts, it's easy to use directional scan to quickly see if there are any potential targets there. (Large numbers of PvP hungry pilots) + (Ease of finding targets) = Rapid death for the unwitting. Why it's dumb: Since the release of the "tags for security" option in the Odyssey update, ratting in low-sec has become more popular. But there are plenty of other low-sec systems that are much less populated and better choices than Rahadalon. Why you'll die: Stepping away from your computer while logged in on your EVE Online character, also known as "going away from keyboard" or "AFK", is a common practice by many players, especially if they are doing boring and repetitive activities, like mining or hauling. But gankers looking for easy and lucrative kills watch for signs of target inattentiveness. Flying a fat freighter full of expensive goodies on autopilot, for example, and going AFK while doing so, may result in your ship sitting motionless in space in the destination system, awaiting further orders. This is tantamount to hanging a big pinata in front of a bunch of candy-obsessed children, and then leaving the room. The result is predictable. Why it's dumb: Flying in space while AFK is a bad practice anywhere in New Eden. Flying in space while AFK, and then forgetting about it, is infinitely more dumb, especially if what you are flying has any significant value. Why you'll die: This is a reference to an "EVE true story" submitted by the song's vocalist, Sindel Pellion. In short, Sin shared pictures of her Real Life legs with EVE Online players in the #tweetfleet group on Twitter. She soon attracted an admirer, who apparently decided to collect an in-game corpse of Sin's character - for the legs. This resulted in an ambush, and Sin lost her ship, her pod, and her corpse. Why it's dumb: In Sin's own words, "Listen to me, kids, and don't repeat my mistakes. If you ever decide to post pictures of your legs on the Internet, be prepared to lose your Vagabond. And your dignity." Leave your blues on your overview - if I shoot him, what will CONCORD do? Why you'll die: If you shoot another ship in high security space, and you have no kill rights on the pilot of that ship, then the CONCORD police force will attack and destroy you - especially if you have good standing (showing up as "blue" on your overview) with that pilot. Setting your overview so that friendly pilots are listed increases the chance that you may accidentally select them as a target and shoot them. Result? CONCORDokened. Why it's dumb: You can configure your overview to not show blue pilots, so you don't target them or shoot them. Why you'll die: The Legion is an excellent strategic cruiser, delivering outstanding damage at well over 20km when fit with heavy pulse lasers with Scorch ammo. In fact, the specialized Liquid Crystal Magnifiers subsystem gives the Legion bonuses for energy weapon capacitor use, range and damage. Since there are no similar kind of bonuses possible for hybrid guns (especially small ones) on a Legion, fitting them on this ship would take its DPS to practically nothing, leaving your expensive Tech III strategic cruiser relatively defenseless. Why it's dumb: Always fit your ship to take advantage or your special bonuses - or have a really, really, really good reason not to do so. Why you'll die: Many a null sec alliance has decided that they have the strength to conquer a neighboring region, and take it away from another alliance. Sometimes it goes according to plan - often it doesn't. Regardless, null sec war is always expensive and bloody, especially for the loser. Why it's dumb: The difference between victory and defeat is an accurate understanding of relative strengths and weaknesses. Excessive confidence in the face of ignorance is a reliable recipe for disaster. Why you'll die: The EVE Online Alliance Tournament is an annual spectator sport where teams of pilots compete in small gang PvP engagements, for glory and recognition of their combat prowess. Pilots are dropped into a space arena and given limited time to kill each other off. Points are awarded by types and numbers of ships destroyed. In this year's tournament, the arena is a 125 km radius around a central beacon. According to the official rules: "If a player warps out/leaves the arena, his/her ship will be destroyed." Why it's dumb: The edge of the tourney arena is clearly marked. The only reasons anyone would go outside the boundaries are: denying the enemy the satisfaction of a direct kill, accidentally using a micro jump drive too close to the edge, or just freaking out and losing track of where you are - all pretty dumb reasons for displaying PvP fail in front of the entire EVE Online community. Why you'll die: Imagine that you are in null sec space, next to a gate. Suddenly, the gate flashes - there's an incoming fleet jumping through from the other side. At the same time, another fleet in your system lands on the gate. And the two fleets are hostile to each other. Suddenly, chaos ensues - and you are in the middle of it - just one more target in the midst of a lot of pilots frantically locking everything and pressing F1 as fast as they can. This is not a good place to be. Why it's dumb: Having good intel and situational awareness are the keys to survival in 0.0 - and not putting yourself in a position where you can get caught. Why you'll die: Pilot License Extensions (a.k.a, PLEX) are items that can be bought and sold in the in-game markets. They can be transported in a ship's cargo hold, like any other item. They can be spent to provide 30 days of game subscription time for a player account, as well as other useful things, like the new Dual Character Training option. PLEX are therefore very valuable. In fact, they are so highly prized that if someone scans your ship and discovers that you are carrying them, you instantly become a prime target. Why it's dumb: There's really little reason to transport PLEX from location to location. PLEX appear in the station in which you redeem them, so simply traveling to the station you want your PLEX in, before you redeem them, is the safest option. Only the bravest of speculators might transport PLEX from market to market, but at extreme risk. These are all of the ways to die described in Sin's and Rixx's parody. Of course, there are many more equally dumb ways to die in EVE Online. Feel free to list some of your favorites in the comments. Posted in Commentary, Fun and tagged with Dumb Ways to Die song, Eve Online. August 2, 2013 by Neville Smit.